Dr Greg Lang is a Professor in Horticultural Science at Michigan State University, USA. He is Chair of the International Society for Horticultural Science (ISHS) Workgroup on Orchard Systems and has been a plenary speaker at many conferences such as the International Fruit Tree Association and ISHS Symposia on Orchard Systems and Cherry. Professor Lang has also been named as one of the top 100 Innovative Horticulturalists of the past 125 years by the American Fruit Grower Magazine. Temperate fruits include stone/drupe fruits (such as peach), pome fruits (such as apple) and berries (such as strawberries). Like other crops, cultivation of these fruits faces a number of challenges. These include the need to optimize yields, sensory and nutritional quality; the dynamic threats from biotic and abiotic stresses in a changing climate; and the need for more efficient use of resources to minimise environmental impact. 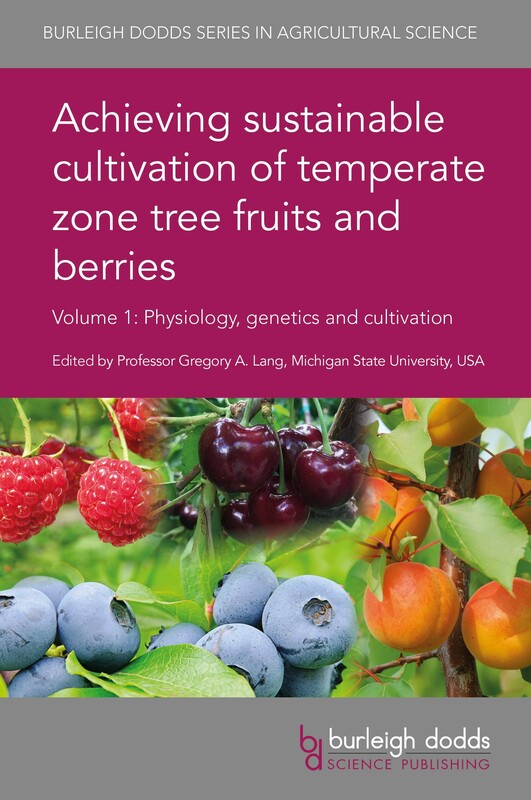 The two volumes of Achieving sustainable cultivation of temperate zone tree fruits and berries summarise the wealth of research addressing these challenges. Volume 1 focusses on key advances across the value chain, from breeding improved varieties to better techniques for cultivation and crop protection. Part 1 discusses current research on physiology, genetics and breeding. Part 2 reviews advances in cultivation from orchard design to optimising water and nutrient management and harvesting operations. With its distinguished editor and international range of expert authors, this collection will be a standard reference for horticultural scientists, government and other research centres and companies involved in cultivation of the range of temperate fruits. "This text, with its impressive line-up of world-renowned contributors, will provide an excellent resource of information about developments in temperate fruit production and about future prospects for further change towards greater sustainable production."